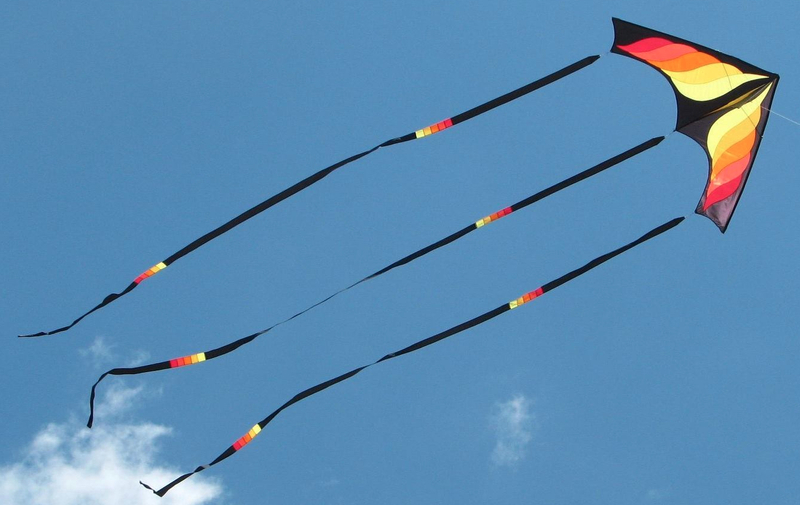 As much as I hate to admit to it, I did not fly a kite today. This morning was the weekly club fly and I didn’t go. I got up this morning and didn’t feel quite right. Couldn’t tell of it was an oncoming cold, a possible sinus infection or just exhaustion due to the fact I was up until 2:00 am sewing on my parafoil. Yes, foolish me! You would think I would know better and not stay up until the wee hours of the morning. I’m not exactly a young college student anymore who could do things like that without batting an eye. But I guess some habits are hard to break. I would stay up late after the family went to bed to work in my darkroom and still get up and go to work the next day. I survived that. Well, maybe not in the best condition but I survived. However, now, after a couple of late nights, I’m wiped out. So, I stayed home. I rested, worked on the computer and started sewing again. I finished sewing on the ribs to the upper panel of the parafoil. All eleven of them. I should have picked a foil with a smaller number of ribs. 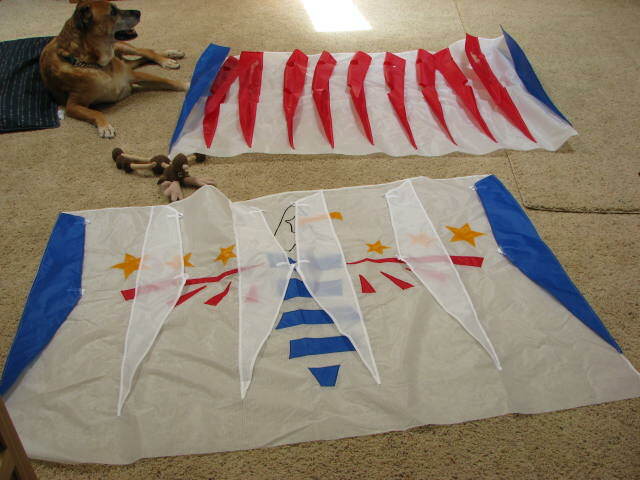 And I got the six keels sewn on the bottom panel. Now I just have to sew the top to the bottom without catching extra pieces in each seam. Then it’s hemming the trailing edge and attaching the bridle. And I’m done, at last. This project shouldn’t have taken this long. I am such a procrastinator. My friend at the kite shop loaned me her painless parafoil so I could see how it flies and how it was put together. So far, things match between that one and mine. The sewing on that one is a lot neater. And, since it is a proven flyer, I’m going to finish my trailing edge that same way that one is finished. Maybe tomorrow, I can fly that one and see how the bridle is set. One less thing to guess at. The dog was kind enough to let me use his space to get a current photo of the parafoil. As long as I didn’t try to move his moose, all was good. He’s very possessive. By the way, a little birdie told me that there was no wind this morning at the beach. I guess I didn’t miss much. i am just following you. Loook forward to looking at your web page repeatedly.